List G Barristers (List G) is Victoria’s leading commercial and public law list and barrister clerking service. The organisation’s prestige derives both from its members—barristers who have worked on some of Australia’s highest profile cases—and the many benefits of joining List G.
List G operates as a “list-owned” model, which means its barristers own, operate, and are invested in the company’s success and reputation. For this reason, List G has held uncontested market leadership for decades, and is committed to contemporary, practical innovation. Evolution 7 were engaged to redevelop List G’s brand identity, and to redevelop the website, to deliver a high-end experience that better reflected the brand, and to highlight the extensive expertise and unparalleled prestige of the list members. 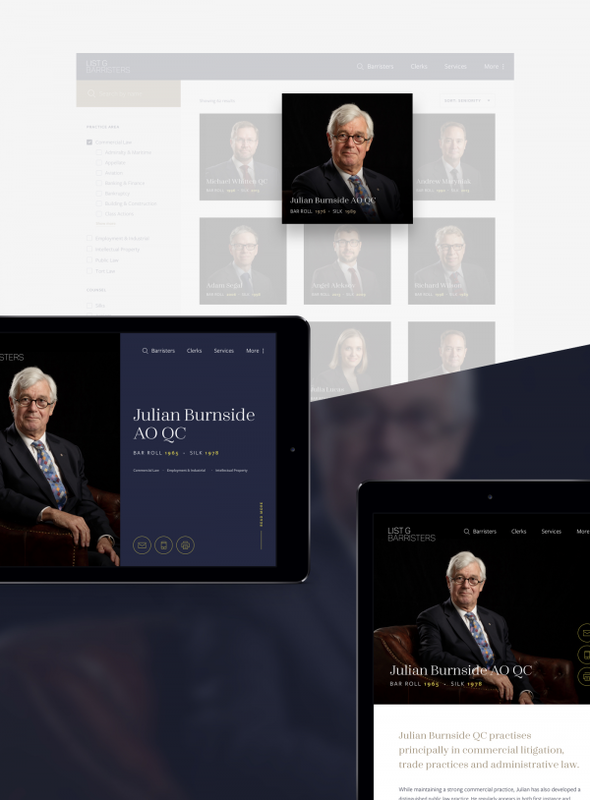 While List G Barristers was well-known and highly regarded, it had allowed its branding and digital presence to become dated. On review, List G recognised its online presence did not reflect the company’s modern philosophy. The team was ready for a total brand refresh and a new website—something that blended elegance, gravitas, and forward thinking. Evolution 7 was tasked with both modernising the band, but also with developing a digital asset that highlighted the quality of the list, and that allowed solicitors to quickly and easily find a barrister with the skill set and expertise required for a case. List G’s website is its most important marketing asset. Solicitors review barrister information and typically make on-the-spot decisions about whether he or she is the right person to partner with on a case. When Evolution 7 was engaged, the List G website was dated, unresponsive, and had a rather clunky UX. 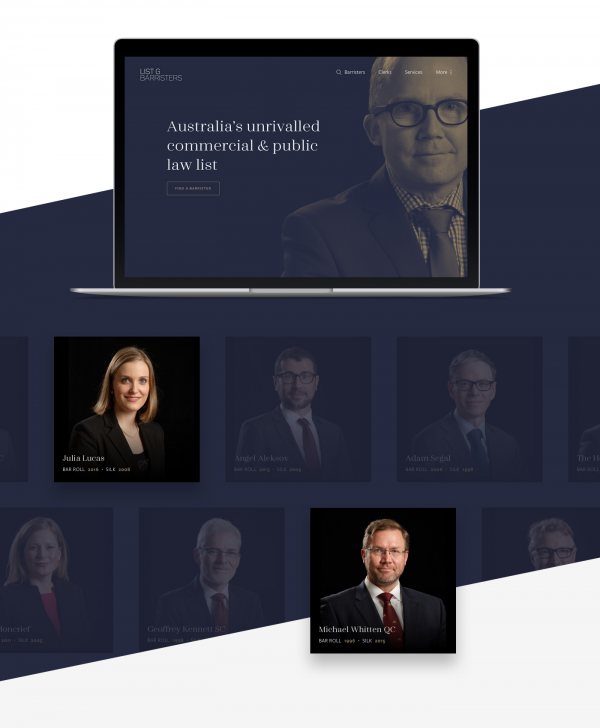 We were tasked with reconfiguring the site to capture the organisation’s reputation for cutting-edge list marketing, generate leads, and appeal to future members and advocates. Our first step was to conduct UX research with solicitors, and understand how, where, when and why they search for a barrister. The resulting insights pointed to a broad range of search patterns - looking for a recognised face or name, finding the contact details of a barrister they already know and trust, or conducting a detailed search for someone who is best suited to a case. This pointed to the importance of the list website as both a way to search for a barrister, but also as a directory tool to locate contact details for known list members. List G Barristers - and barrister lists in general - occupy a specific niche in the legal world, which makes conventional marketing efforts largely irrelevant. With only several reputable lists, and these well-known to all solicitors looking to engage a barrister, awareness is already especially high. Therefore, attentions shift to the quality of the list, and ensuring the list’s branding is distinctive and easily identifiable. With the barristers on the list being the organisations key asset, we put this content front and center with a sophisticated and lightening fast search experience. We were also engaged to redevelop the list’s brand. Stylish sophistication rests at the heart of List G’s new brand. We paid homage to the original primary colour (a vibrant yellow), muting it slightly and drawing in other complementary colours to round out a new, modern look. 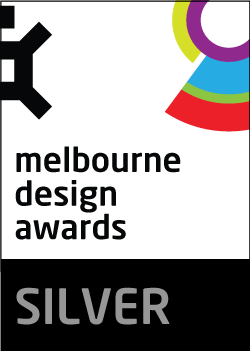 In addition to a fresh colour palette, we also supplied List G a new logo, font family, and photographic style. We agreed that, for this project, standard headshots would not suffice; instead, barrister photography had to be executed in a way that kept List G a cut above the rest. We provided close creative direction, working alongside List G and a team of photographers to ensure everything from posing to positioning, lighting, and set matched up with our shared vision. Prior to developing a user experience, we interviewed solicitors and barristers to uncover the insights most important and relevant to them when searching for a barrister. We then applied this knowledge at a UX workshop with key stakeholders. By the end of the day, we’d arrived at a sleek, intuitive user journey able to accommodate visitors of all ages and levels of tech-savvy. Our research revealed that the List G barrister directory was the most important and searched section of the site. To simplify and sophisticate this experience, we used Algolia to incorporate powerful search and filtering functions. 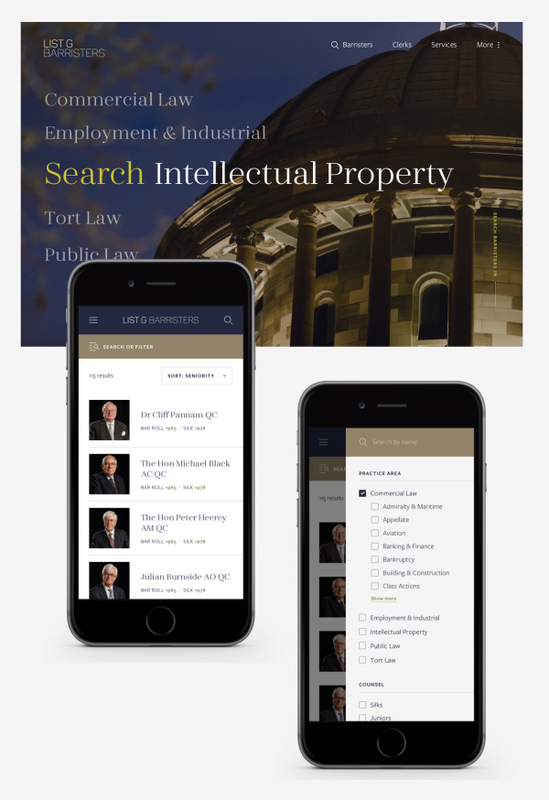 At the click of a button, users can now instantly surface card-style previews of barristers across preselected areas of expertise: tort law, intellectual property, commercial law, and so on. 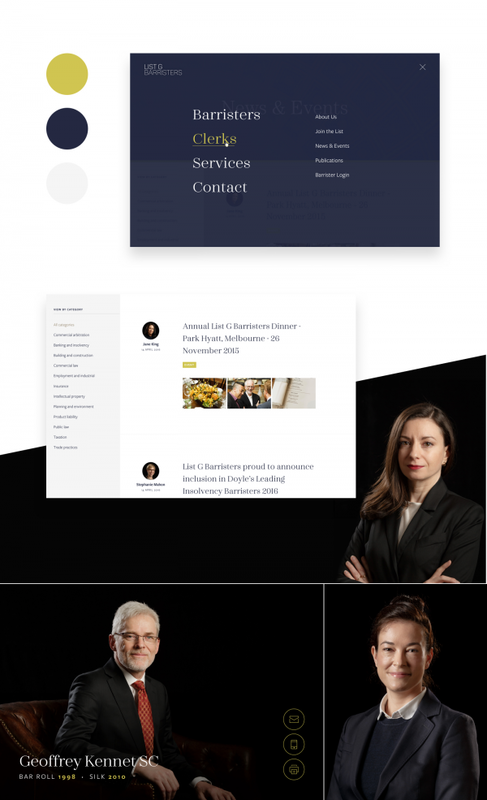 Selecting a barrister from the directory leads the user to a polished profile page, complete with bio, contact information, recent cases, qualifications and, of course, a crisp professional photograph. Our team also implemented an open-source and reliable technology platform that supports best practices, is standards compliant, and covers key requirements for SEO, accessibility, and social media. Most importantly, we successfully delivered a sharper, more elegant online experience for users, and freshened up List G’s esteemed brand.